The 80s were a fantastic time. Just look at all the great music, sweet arcade games, and classic films coming out almost daily. It's hard for people to disagree with that (that is until someone brings up the mullet.) Back then all those bright neon lights were a fantastic inspiration for the clothing of the time. The bracelets were no exception. They were inspired by one of the most iconic parts of the quickly modernizing America, gumballs! Those bright colored sugary treats were perfect for transitioning into the world of fashion. Before you head out to the next Madonna or Blondie concert be sure to put on one of these 80s Pink Gumball bracelets. They're sure to catch everyone's eyes at the concert and they'll go great with any kind of clothing you're wearing. 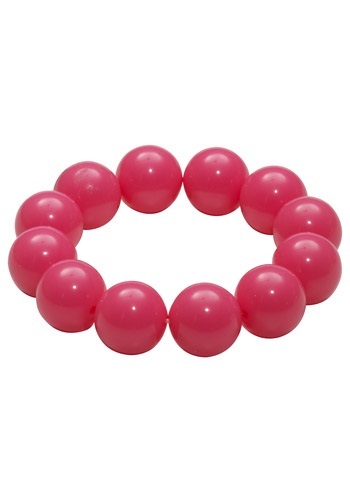 This candy inspired jewelry will look so good on your wrist, you'll have to be careful that nobody tries to take it themselves for something to chew on!